Animal Jacquard Poncho have a soft sheen and come in a wonderful range of colors, patterns and styles to suit any outfit. Designed and crafted by our master craftsmen, our Poncho are manufactured with pure fabric and are developed on an hand-operated industrial machines.Buy Wholesale scarves in bulk quantity at discounted prices as ENGLISH CREATIONS CRAZE is a wholesaler From India, manufacturer, supplier, exporter of scarves, shawls, stoles, Pareos , Kaftans, Sarongs, bags, ponchos, Kimonos, jacquard scarves, printed scarves, fabrics. 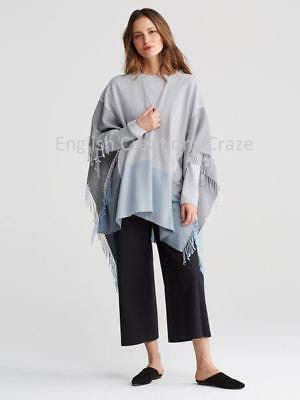 Wool Jacquard poncho are manufactured with luxurious fiber and provide a soft comfortable warm feel and incredible look. We are reckoned for creatively manufacturing and exporting a wide stock of Wool Jacquard poncho which are Perfect to accessorize with formal or casual attire from Amritsar, Punjab, India.Buy Wholesale scarves in bulk quantity at discounted prices as ENGLISH CREATIONS CRAZE is a wholesaler From India, manufacturer, supplier, exporter of scarves, shawls, stoles, Pareos , Kaftans, Sarongs, bags, ponchos, Kimonos, jacquard scarves, printed scarves, fabrics. Women Ponchos sare a hot choice among women in America and European countries like Germany, Spain, France and Italy and sold by us at wholesale price.We are the exclusive manufacturer and supplier of these Women Ponchos from India.Buy Wholesale scarves in bulk quantity at discounted prices as ENGLISH CREATIONS CRAZE is a wholesaler From India, manufacturer, supplier, exporter of scarves, shawls, stoles, Pareos , Kaftans, Sarongs, bags, ponchos, Kimonos, jacquard scarves, printed scarves, fabrics. Women Poncho is manufactured, exported and sold in attractive colors and exclusive designs. 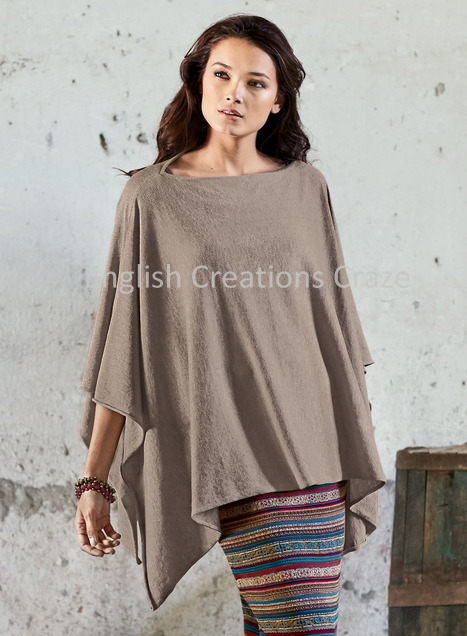 Soft, comfortable and warm, Women Poncho can enhance the style and beauty of the outfit of modern women. Importers buy Wholesale scarves in bulk quantity at Competitive prices as ENGLISH CREATIONS CRAZE is an exporter From India, wholesaler, manufacturer, supplier of scarves , shawls , stoles , bags , ponchos , jacquard scarves , printed scarves, Pareos, Kaftans, Sarongs, Kimono , in all kind of fabrics From India. We manufacture Women printed Ponchos that are made using silk fabric. 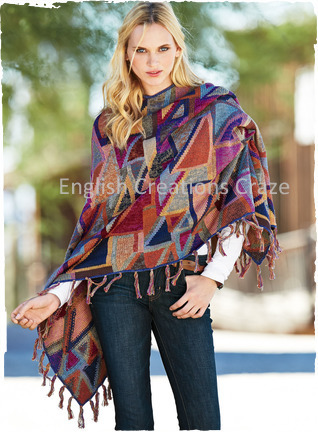 Women printed Ponchos are comfortable and soft so these can be worn in any season. These are available in host of designs and color that reflect the fashion trends. Clients can buy Wholesale scarves in bulk quantity at Competitive prices as ENGLISH CREATIONS CRAZE is a manufacturer From India, wholesaler, supplier, exporters of scarves, shawls, stoles, bags, ponchos, Kaftans, Sarongs, Kimono , printed scarves, jacquard scarves, Pareos and fabrics. We are a leading organization involved in manufacturing, exporting and supplying Women jacquard Ponchos in Amritsar, Punjab, India. These are Luxuriously soft and full of comfort.Offered Women jacquard Ponchos are finished with a delicate eyelash fringes to give more attractive look.. Customers can buy Wholesale scarves in bulk quantity at discounted prices as ENGLISH CREATIONS CRAZE is a supplier From India, wholesaler, manufacturer , exporter of scarves, shawls, stoles, bags, ponchos, Pareos, Kimonos, jacquard scarves, printed scarves, Kaftans, Sarongs, and Fabrics. Women Wool Ponchos is finished with a delicate eyelash fringes to give more attractive look.. We have very big experience to produce these Women Wool Ponchos as an affordable luxury to be enjoyed.Clothing stores can buy Wholesale scarves in bulk quantity at discounted prices as ENGLISH CREATIONS CRAZE is a supplier, wholesaler, manufacturer , exporter of scarves, shawls, stoles, bags, ponchos, Pareos, Kimonos, jacquard scarves, printed scarves, Kaftans, Sarongs, and Fabrics From India. Women blended Ponchos are manufactured in various textures and colors. They are made of luxurious fiber and provide a soft comfortable warm feel and incredible look.The vibrancy of colors and uniqueness make Women blended Ponchos attractive.Brands can buy Wholesale scarves in bulk quantity at discounted prices as ENGLISH CREATIONS CRAZE is a supplier, wholesaler, manufacturer , exporter of scarves, shawls, stoles, bags, ponchos, Pareos, Kimonos, jacquard scarves, printed scarves, Kaftans, Sarongs, and Fabrics From India. The women’s poncho is a beautiful piece of garment that performs various roles at the same time. 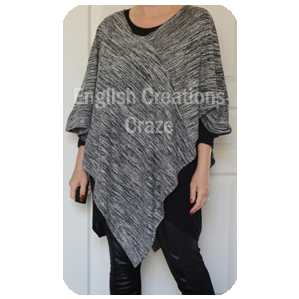 We are proud to announce that English Creations Craze is the among the leading poncho manufacturers in the world. Our ponchos for women are a craze everywhere in the world including the Middle East countries. Our poncho clothing has a vibrant local market in India. We have clients in almost all the big cities in India. India does not have a very cold climate. Hence, a major section of Indians prefers to have a poncho towel instead of their sweaters and other woolen clothing. The woolen ponchos give adequate protection from the cold and also allow the wool poncho woman to make a fashion statement. Our animal jacquard ponchos come in a range of astonishing colors. These garments have a soft sheen whereby it becomes extremely comfortable to wear them over all outfits. We source our wool from quality sheep and goats. We subject these raw materials to tough treatment to ensure that they last a lifetime. Our web store has a tremendous range of ponchos on display. We have distinctive female ponchos and ponchos for males. The poncho for a girl differs from that of a boy in the range of colors and designs. Women prefer attractive and flowery designs whereas the choices of men are different. They always like to go for sober colors and prefer to have them either plain or with stripes. Ordering our ponchos online enables you to get them at the best rates on the market. You can order them at factory rates if you approach the factory outlets directly. Large retailers can also order their ponchos in bulk and get the benefit of discount offers. The most attractive aspect of our services is that the bulk order customers get the facility to incorporate personalized designs on their ponchos. Send us your designs in advance and we undertake to include them while designing your consignment. The personalization of your ponchos is our USP. It helps you to make a mark in your market.